Is the California Condor Out of the Woods? This post was originally published at Scientific American. 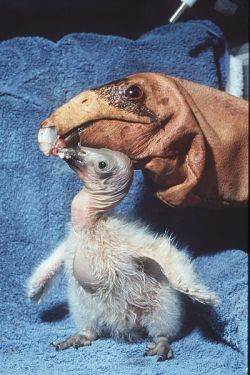 Condor chick being fed by condor feeding puppet Wikimedia CommonsThe population of endangered California condors (Gymnogyps californianus) hit an important milestone last month, reaching a high of 405 birds—quite an achievement for a species that was down to its last 22 individuals just 25 years ago. California condors—North America’s largest birds, with a wingspan of up to 2.8 meters—were almost wiped out by poaching, DDT and lead poisoning before all of the remaining birds at the time were brought in from the wild in 1987. Captive breeding programs have increased the number of condors dramatically since then, and according to the April 30 census cited by The Oregonian, there are now 226 California condors living in the wild in California, Arizona and nearby Baja, Mexico. An additional 179 birds live in zoos and breeding centers. The population has increased more than 20 percent in the last two and a half years alone. But condors still face threats on several fronts, chief among them the continued use of lead bullets by hunters in Arizona. California banned lead ammunition in the condors’ habitats in 2007, but efforts to limit its use in Arizona have so far failed. Condors, as scavengers, eat the carcasses of animals killed by lead ammo (or the “gut piles” of innards left behind by hunters) and often die as a result. At least 22 of the condors released in Arizona have died from lead poisoning, according to a report from MSNBC. Up to 95 percent of the birds in the state have lead present in their blood, and a painful and sometimes fatal process called chelation is often used to remove the lead from their bodies in both states. The Arizona Game and Fish Department says efforts asking hunters to voluntarily use lead-free ammo (or turn in gut piles from animals killed with lead ammo) are working and blames the condors themselves for getting sick, saying they are flying over the border into Utah and eating lead-laced carrion there. The Center for Biological Diversity (CBD) and other organizations don’t buy that excuse: Last week they notified the US Forest Service that they would sue to stop the continued usage of lead ammo in Arizona’s Kaibab National Forest, which is home to more than 60 of the state’s 78 condors. This will be the latest CBD lawsuit attempting to limit the use of lead ammo, which has been cited as the biggest threat to condor survival in the wild. Meanwhile, even captive breeding is far from foolproof. California condors only lay one egg a year, and survival rates are still on the low side. Out of eight eggs laid at the Oregon Zoo’s Jonsson Center for Wildlife Conservation this spring, one was infertile, one embryo died in the egg and two chicks died of indeterminable causes.